The sighting of a Pangolin at Marc’s Camp as reported in last month’s newsletter by our tourist guide, Vanessa, has caused a substantial stir. I have received a number of comments from friends and previous guests. Old timers to the Kruger Park who have been there hundreds of times without ever seeing a Pangolin are turning greener than the grass at Marc’s. This is due not only to their envy but also to the lack of rain at Marc’s. In fact Tremisana Lodge recorded a paltry 8mm of rain for the month ! 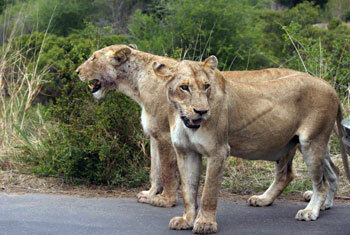 As a result of the dry conditions, Sandra and I decided to go on a full day Kruger Park safari on Friday 28th November. Wesley conducted the safari with his usual confident passion and aplomb and we were very fortunate to see the Big Five twice. In fact , at Kumana Dam, south of Satara, we had an amazing simultaneous sighting of a Leopard up a tree, buffalos in a mud wallow (all that remains of the water in the dam ) and two White Rhino resting under a tree – WOW ! This is what makes Kruger Park so very special – the really expensive private lodges may boast about their sightings, but how often do they ever equal something like this ? The lowveld is still dry – we received a little rain to change the vegetation but not enough to fill the dams. Most of the animals of Balule Reserve have moved to the south of the game reserve because the vegetation is greener there. The dams are getting dry and hippos are moving to the permanent rivers. During a bushwalk we spotted a few dung beetles busy processing elephant dung. One dung beetle was hijacking a dung ball from another dung beetle. It was not easy to get the ball because the original owner fought back and rolled the ball very fast to get away from the hijacker. Around Tremisana lodge we are still seeing many animals, because the natural water holes are dry and animals drink water at manmade water holes. Animals coming around the lodge include Impala, Elephants, Buffalos and giraffes just to name a few. They like to feed between the lodge and Tremisana dam on the southern side of the lodge. It was a good day with lovely weather and the guests were ready to see animals. Everyone was happy to be out in bush. I asked my guests if they were looking for any specific animal and the answer was no, anything you can find for us will be interesting. Their undemanding statement encouraged me – I was happy to hear that from the guests. We drove on the main road from Orpen towards Satara camp and along the way we spotted lots of general game like Zebra, Waterbuck, Impala, Nyala and Bushbuck. The latter two animals are not easy to find in Kruger unless you drive along a river. The Timbavati river has quite a few Bushbuck and Nyala. 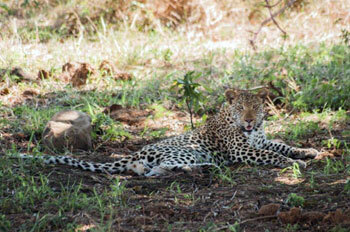 Our first Big Five sighting was of a leopard from a distance. It took me a couple of minutes to show it to my guests because it was really far. Luckily it stood up and gradually moved towards us and eventually crossed the road right in front of us. Everyone was happy and looking forward to see some more animals. We continued driving and we met up with another safari company and they informed us about a lion sighting along the H-6. We went straight to the place and found two big male lions sleeping next to the road. After lunch we went up north of Satara via the Timbavati picnic site looking for the rest of big five. We were blessed by a wonderful sighting of two Black Rhinos along the S12. They were very close to the road and one walked right next to the car. On our way to the place where we walk we stopped to look at impalas and one came out from the bush walking very slowly and suddenly collapsed on the road. I suspected a leopard and I was right – we drove forward so we could see what was going on. The leopard was behind the bush but was moving away. The impala was bleeding and its neck was broken. We left the sighting and went for a walk along the Olifants River. The walk was very interesting and enjoyed by the guests. We saw two hippos fighting and pushing each other very hard. A young male hippo was showing submission but the big male keep on attacking the poor young hippo. It happens when the water levels are low and the hippos all share the few deep pools. The sightings have been great this month with a few very close encounters with the Big Five. The bushveld is still waiting for the rain to bring new life to the parched landscape. This however has made for some very good viewing, especially around the waterholes. It was at a waterhole that my very lucky guests had the opportunity to view an amazingly close experience with a pride of lions and their very recently newborn cubs. While sitting watching a herd of elephants drinking at Nsemani dam, we got the news of lions feeding on a buffalo. We headed just a little further up the road and spotted the pride tearing at the remains of a large buffalo carcass. It was in the distance but still a good sighting. While sitting chatting about what lions like to hunt and who gets to eat first, we all agreed that it would be so nice if the lions moved down to the water for a drink. It wasn’t long before our wish came true – one of the lionesses decided to move down towards the water, but didn’t go for a drink, it rather headed past the water and straight towards our vehicle ! We sat watching with excitement as she came closer and closer calling the whole way. It was then that I knew there must be cubs in the area. The lioness walked across the road in front of us, and disappeared into the thick vegetation, and when she eventually returned, she did so with a string of seven cubs following behind her. An amazing experience and so close to the action, an experience my guests and I will NEVER forget ! The rhino is a big part of the attraction of the Kruger National Park and to see them roaming in their natural habitat is simply superb. My personal best would have to be a close encounter with six big females and one new member of the crash, around two years of age. They had been moving along the road a little way in front of us, so we headed in for a closer look, they all stopped to inspect what we were, which gave my guests an excellent chance to get some photographs, and then they moved off in a hurry keeping the little calf close by for safety. The elephants are always a fun experience whether it be a large bull crossing in front of the vehicle and then turning around, with its ears spread out and trunk raised giving us a sense of how big he really is or a big breeding herd heading down towards he waterhole for a swim and a mud bath. It was a particularly hot day so we decided the best thing to do would be to head to a waterhole, and possibly view some animals heading down to drink. In the distance we could see several large shapes heading towards the water, with their big ears flapping in unison – it was of course the elephants heading down for a midday drink. We had the privilege of watching as the matriarch lead the herd towards the water followed by her very new calf and the rest of the herd, consisting of all shapes and sizes. The youngsters wasted no time in getting nice and wet, rolling around in the shallow water, having little sips of water every now and then. The matriarch then decided it was time to go. She turned around, trumpeted and started moving off towards the tasty looking trees. She was followed obediently by the rest of the herd, who all looked quite refreshed and ready to take on the heat once more. The buffalo, a big powerful animal with very a very dangerous set of horns often used to defend themselves from things like lions, are always an interested animal to see – especially in big herds. It was after lunch and we had set off in search of a nice close buffalo sighting. Late in the afternoon is often a good time, as temperature starts to cool down and most herd animals start heading towards the waterholes for a drink. We were heading along, stopping for the occasional giraffe and zebra, when in the distance along the road we spotted several large shapes on the road – it was just what we had hoped for: a big herd of buffalos on the move. The leopard, a tricky customer to find mainly due to its ability to blend in so well with its environment, is always exciting to see. It was towards the end of a great day in the Kruger, on our way towards Orpen gate, that we were treated to a super sighting of a very relaxed leopard, sitting next to the road. We sat and watched as it stood up, posed for the camera and then walked off into the long grass, a great way to end a brilliant day. Throughout the month of November I have had some remarkable sightings with my guests. 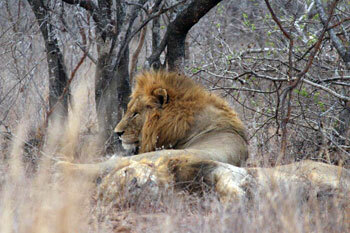 Kruger has proven itself to be a fine host for the Big 5 plus more. Since the rains have fallen, the landscape has been changed vastly and there is a noticeable amount of general game returning to the open areas. Quite often I find myself stopping the vehicle to allow right of way for many impalas, zebras, wildebeest and giraffe as they make their way across the roads. Along with the rains, temperatures are rising which creates such a scene at the major water holes. Often we will find the elephants having a morning swim or afternoon drink, which then turns into a mud bath then followed by a nice dust roll. Quite an impressive sight, especially when we get to marvel at the larger breeding herds over 30 elephants strong. With the return of the plains game comes more frequent sightings of the big cats. I have had some spectacular lion sightings including mating pairs in the road, males on buffalo kills, 4 young males surrounding our vehicle, mothers and their cubs, attempted kills, and of course many lazy lions sleeping under the shade. This month what stands out the most amongst the cats are the number of Cheetah I have seen in the park. I usually consider myself lucky to see one cheetah a month, but November has been out of the ordinary with 7 different cheetah sightings. Approximately 200 cheetah are recorded to reside in the Kruger National Park, and the worldwide total is estimated to be only 12,000 cheetah 1/10th of which are in captivity. In the last decade cheetah numbers have dramatically dropped 90% which has put them Appendix 1 with CITES and Vulnerable Species within the ICUN. This is largely due to human interference through means of loss of habitat, wealth status from wearing cheetah fur and the shooting of them on sight for the threat they pose on livestock. Additionally in nature, cheetah cubs have a high mortality rates as they are the lowest ranking predator. 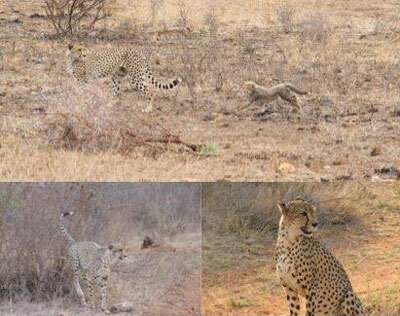 Many cheetah cubs will be killed by lions, hyena, leopard, wild dogs and also larger eagles. Statistics show that 90% of cubs will not reach adulthood. What is usually quite a rare sighting, I have been blessed with 7 this month and I still cannot believe it, where 4 out of the 7 were totally unexpected. One sighting was of a mother moving her cub to a different location. This cub was extremely playful whilst the mother was on full alert. They both walked along the side of the road and then crossed in front of our open vehicle. It was only 3 days later where we then witnessed in the same location, 3 cheetah brothers relaxing under a tree not more than 3 metres from the road. As we pulled up they then got up and crossed together surrounding our vehicle. Another unexpected sighting was of a lone male, he was a little further back from the road moving quite quickly but not too quick to stop for a territorial marking display. He stood in front of a bush and sprayed his scent over it, just to let other males in the area know this territory belongs to him. The remainder of the sightings were cheetah sleeping under a tree or camouflaging in the bushes keeping us on our toes and making us work hard for the sighting. The Cheetah is a remarkable animal and such a beauty to see in the wild. Their elegance and stealth is always a marvel to watch. I see it as no more than a privilege to be able to show the guests these cats, and to see their amazed faces when we do see them is also comforting and extremely pleasing to me. Perhaps in another decade if the decline continues we may not be able to see cheetah in the wild. Lastly, how can I fail to mention my most “special” sighting this month : 2 Black rhinos, a mother and her calf we found browsing approximately 70meters away from the road. I was explaining to my guests how rare it is to see black rhino in the park, which is why my excitement levels sky rocketed through the roof! We were able to get nice pictures and just watch them as they began to browse closer and closer. We sat with them for approximately 20 minutes and to my surprise they began to approach us. We were the only vehicle there, and the two rhinos came approximately 2 meters from us. It was such a fantastic feeling that they felt comfortable enough to come to us, check us out for a few seconds and continue browsing around us. This lasted for another 20 minutes as they then made their way back into the thick bush. 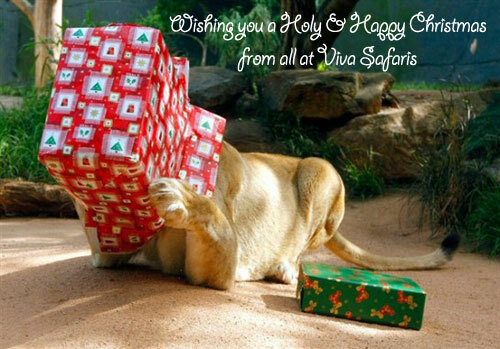 I just joined Viva Safaris this month. It really has been an exciting month. I have settled in very well as I am very familiar with Balule, having worked here for many years. I have been doing all my activities in Balule – mainly doing the morning bushwalk, afternoon drive as well as evening Sunset drives. One morning walk we left the lodge early in the morning just around five. We drove down to the walking spot. We did not see much during the drive except for a few impala as well as one giraffe who seemed to have been waiting for us as we drove out of the lodge. We reached the walking spot and began our walk. As we approached the river we managed to see three big crocodiles on the river bank. When they saw us approaching two quickly ran into the water. The third crocodile remained in the same place opening his eyes once in a while. He eventually went into the water as well but at a very slow pace. The guests were very excited with the sighting. While doing another bushwalk we had been walking for a while when we spotted a Black Rhino. The rhino spotted us and looked at us directly. He started advancing towards us and some of the guests were very scared. I told them to keep calm and slowly move backwards. There was a sudden sound in the bush and the rhino looked in the opposite direction. A lone zebra emerged from the bushes. The rhino entirely shifted his focus. We actually felt like he had forgotten about us. He looked at us for a last time and changed his direction and walked away into the bush. During an afternoon drive after having driven for quite some time without seeing much we came across some elephants. It was a very hot day and my guests were beginning to lose any hope of seeing anything. The elephants were a welcome surprise. On an evening drive we managed to see a lot of general game including zebras, impalas as well as giraffes. Our first sighting was a few elephants. They were busy feeding while some were making their way to the other side of Olifants road. When we were making our way to Marula Boma, we saw two small figures walking in front of us. I shined the spotlight and realized they were two honey badgers. Once we had their attention via the light they quickened their pace. After a few minutes they walked off the road. As we were driving back to the lodge we came across a lion sighting. The guests were very happy. We spent almost twenty minutes at this sighting. I believe that the month of December will bring more sightings. Wesley wins this month’s “Procrastinator” award – in fact he set a new record by submitting his report a full 5 days after everyone else – well done Wes ! This month has been a truly amazing one, the weather hasn’t been on our side recently but the rains are a blessing in disguise with a lot more birds arriving like our woodland kingfisher which we hear every day at the lodge making sure everyone is up bright and early. The rains also mean the vegetation has started changing slowly, the trees are full of leaves and the grass is slowly changing as well but sadly not enough rain to fill the dams which makes for good days in Kruger with many animals congregated around the waterholes. Now this day had started like so many before it with everyone on the vehicle excited. I had a full car that day and Piero and his wife Sandra had joined me as well so the pressure was on to make it a good day, but we didn’t have a clue what nature had in store for us. We got into the park at around 9 so nice and early to find all the animals but sadly it had been rather quiet the first bit before reception and we were already losing hope with getting only a few impala here and there. We sorted the paper work out and headed into the park but again were disappointed with not getting much other than impala here and there but then out of nowhere one of my guests shouted out they think they see a rock with ears in the river bed and now all of us were a little worried but reversed and found it to be a huge White Rhino bull sleeping in the river bed giving us a beautiful shot of his bum which did look very much like a rock, we reversed and went forward but he was in such thick bushes we couldn’t get a good shot of the rock with ears so we pressed on. Along the way to Nsemani dam we again got a few zebra here and there and some giraffes, it’s always nice to get to see these animals, we carried on to the dam doing a small loop before the dam hoping to get some lions or anything else as it was rather quiet and hopes were dwindling. We got to the dam and again nothing not even a car in sight and only a few noses of the hippos popping up every now and then but nothing spectacular, just before turning around I noticed a few cars gathering at the other end of the dam and instantly sped there and to my excitement there was an elephant but that’s not where the cars were so I pushed forward a tiny bit and one of my guests screamed out LIONS!! Instantly I moved the car to the best position and there about 50m in, but nothing blocking our visual, were 2 female lions sleeping under a tree. We sat with these beautiful cats for a while all excited about the sightings : elephant and lion not even 50m apart was fantastic, we got some photos when they decided to lift their heads up but they always flopped back down. After the excitement we decided to make our way to lunch have an early one and then see what we could find after lunch, just before the lunch area I spotted 3 bull buffalo just in the distance and one of the guests asked if we could maybe sit until they got a bit closer and that they did, in fact they decided to cross the road right in front of the vehicle allowing for some beautiful sightings and photos. We then headed to lunch all very happy with the sightings so far, having 4 out of 5 before lunch and having a quiet morning we were all happy! After lunch there was ample time to play with and given a few updates I decided to push to the far one of a leopard sighting, so we headed south to another dam. Not even five minutes after lunch we saw more cars piling up and I knew something good was ahead only to our surprise we found nine more lions in the river bed but there was just too many cars so we decided to check them on the way back as we would have to use the same road going out, we raced towards the leopards area hoping to get there before they moved off, we sadly didn’t get much along the way other than a few elephants giving us a better sighting of themselves and allowing for once again some good photos. After what seemed like forever we eventually arrived at the sightings and there they were one male lying under a tree in full view and then about 100m away was a female up a tree, we decided to go for the female as to allow the traffic to die down, when we got to the female to our surprise there was as well 2 rhinos and a small herd of buffalo at the dam!! This was amazing, 3 out the 5 all in one sighting we didn’t know where to look and what to take photos of as we had sightings everywhere! We spent so much time there taking photos of everything and eventually got a good shot of the male leopard and were the only car on the sighting which was absolutely amazing. This sighting was truly amazing and everyone was left speechless with only the word wow being said with all the animals around us. After a while we had to move off to make it in time for the gate, the road back to Satara was very quiet with only impala along the way but after the sighting we just had nothing could compare so we didn’t stop. We stopped for a quick bathroom break and to restock the water supply as it was very hot and then made our way to the exit, when approaching the dam where the lions were we saw many cars all huddled to one side and we raced knowing something was there, when we arrived we found the two females we saw earlier had called their babies over and were playing in the rocky area, everyone was speechless, we were all extremely luck! There was nothing but group “awwww”s as the babies played with their moms and each other!! We had a fantastic day and everything we saw was truly special. We headed for the exit all very happy with the day we had, it just goes to show to never lose hope with the day as anything can happen. TREMISANA is very dry – we have been watering the gardens regularly. Mosquitoes have been rare this November. Notwithstanding this, we have given each and every member of staff at Tremisana and Marc’s Camp a new mosquito net as an early part of their Christmas presents. Once the big rains fall, these will be very useful. In fact we had the whole camp sprayed to prevent any malaria – thanks to Amy of the Warden’s team for organising this. We have a good relationship with the people living at the Warden’s House. You may not know that this house was built on land donated by Tremisana ! This month their borehole packed up and we were pleased to assist in supplying water to the occupants of the Warden’s house – I am afraid that we simply cannot have smelly neighbours ! Game viewing around the lodge has been relatively good as the waterhole in front of the Lapa and the Tremisana dam are filled via borehole water. 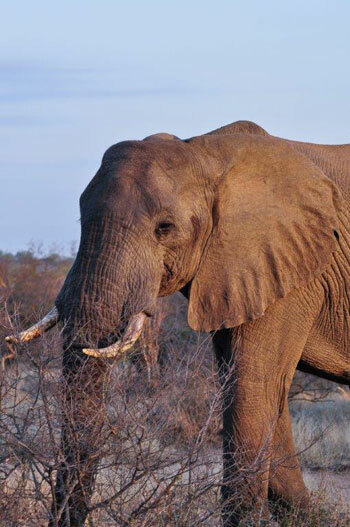 There have been sightings of elephant quite close to Tremisana – guests have been a little scared when seeing these huge animals in the car park ! The month of November has come to the end and I am still hopeful that the rains are still going to come down and give more life in Balule. We have experienced a few days of light rain. We have had days of very high temperatures and it’s always a good enough reason to take a dip in our lovely pool at the lodge. We have had sightings of general game such as giraffes, warthogs, impalas and zebras around the lodge. I still have love for the monkeys that live at the lodge with us. During a drive to the Marula Boma we came across a breeding herd of elephants. This made me really happy. The little babies were very beautiful. I find myself constantly waiting for elephants to come to the lodge or a leopard to perhaps make a grand appearance at the gate, so I take every chance to wander off during my free time to look outside. During my little walks as I make my way to the breakfast Lapa to check if there was any animal close by, my eyes opened up to something that I had not really paid much attention to in the garden – an exciting world of insects . There are so many different kinds in our garden that I might just become a part time entomologist. The one that took my heart is the handmaiden moth. 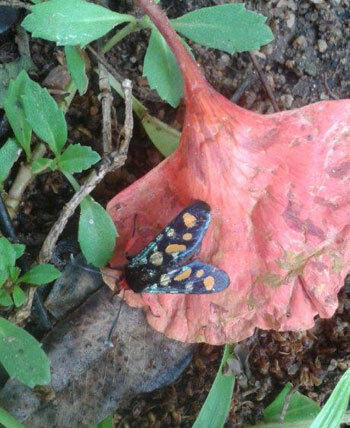 A beautiful moth with bright colours that made me spend a day trying to figure out what it was. There are so many of them in the garden. For those that love insects our garden is a lovely place to have a little adventure during your stay with us. MARC’S CAMP has had a lot more rain than Tremisana but is still dry compared to previous years. The nyala have had a large number of lambs and it is great to see these youngsters running around with boundless energy. As with Tremisana, all staff have been given new mozzie nets and these are being put to good use. 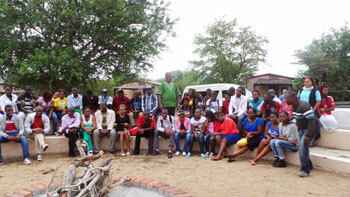 On the 29th November we hosted 65 youth from Acornhoek Catholic Church at Marc’s Adventure Camp. Father Jerome conducted a formation day and we were happy to supply some food and the venue for this important spiritual program. Ronald reports that the tourists are all very pleased with both the game sightings and the standard of accommodation. The food has also improved according to repeat clients. I have no doubt whatsoever that this is because of the excellent prowess of Janetta in the kitchen – before joining Viva Safaris she ran her own very successful restaurant, Wildebees Lapa, at Kampersrus near the Moholoholo Rehab Centre. I wish to thank Pick n Pay for the generous hampers which we handed over to the 25 orphans and youth at the Acornhoek Catholic Church. Bongani accompanied Sandra and me to the Christmas party and was impressed by the genuine happiness that the young children displayed on receiving their hampers. After they had eaten ice cream and cake, they put on a great concert for us. The singing was exceptional. It is very disturbing to learn that the poverty in the area is so acute – I am pleased that Viva safaris can put something – however small – back into the community. Thanks to Father Jose for all the great work that the Comboni Missionaries do here and in other parts of Africa ! We have developed a sound relationship with Mrs Janine Dixon of the International Hotel School. She is using Viva Safaris to allow some of the students to get experience and insights into how a game lodge works – very different to a normal hotel. 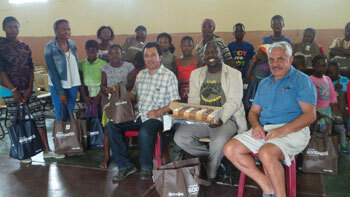 We had Siyolo, Abongile and Thando with us and I am sure that they leave with fond memories and useful experiences. 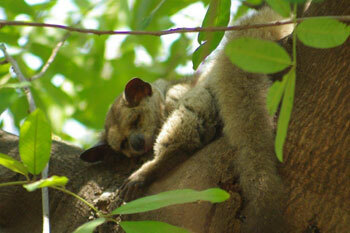 When looking for a Kruger park safari we came across Viva Safaris and booked three days with them. 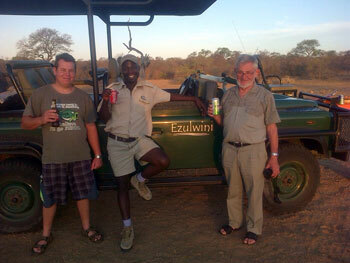 We spent one night at Tremisana and did an evening drive with a bush braai starting from there. The lodge was nice, had all the basic amenities (and even a pool), our room was clean and roomy enough. The following day we spent all day on a safari in Kruger. On both the evening drive and the Kruger safari the guides were amazing, giving lots of infomation and showing us various animals. They were really skillful and have lots of knowledge about flora and fauna. But I shouldn`t forget everyone else working for Viva and at Tremisana. 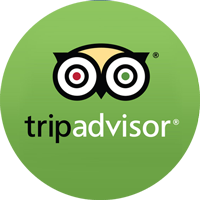 They were all wonderful and very helpful, providing good service and making sure we have a great experience. Unfortunately we only had time for a short safari, we would have definitely wanted to stay longer and also spend some time at the lodge. I read about Marc’s Treehouse Lodge on Trip Advisor and couldn’t believe the review about a person that complained about insects and bugs in his Treehouse/Tent/Room.. I mean what do you expect when sleeping in the bush? A golden pillow and silver soap? When we came to Marc’s Threehouse Lodge, electricity was out and first this made me nervous, but when we discovered the place it made me feel stupid about my first emotion. People, this is a “Treehouse Camp”, and it’s in the midst of a Natural Environment, what else do you expect when going to a National Park? Oh and electricity was up and running by the time we took a swim in the pool and got ready for dinner, so all was totally ok. The Camp is hosted by a lady named “Pretty” (and yes she is!) and another lady who’s name I forgot (so sorry!) and they’re lovely! We did all reservations by email and when we arrived they didn’t know we we’re staying in a tent or a treehouse, but after 5 minutes it was all figured out and we got a tent. This tent was luxury when you compare it to others: beds, linen, light, fan, no mosquitos and etc.. I had a great night sleep, and although the tent is a fair walk from everything, it makes the place more mysterious, exciting and remote. As other reviewers tell the same: this is a natural environment where buffalo’s and impala’s can walk free and in stead of thinking this is scary, it’s rather amazing. This is where nature meets man and without man bringing it down. We loved it here, and I wished we booked longer than 1 night. Viva Safaris and Ezulwini Lodges joined forces earlier this year in putting together a great prize used in a raffle to raise funds for a cash-strapped community of contemplative nuns. They will certainly have a better Christmas this year ! We are pleased that the raffle in aid of the Capuchin Sisters raised just under R 110 000. Sister Maricela has informed me that all the necessary repairs to the Convent have been effected and some new sewing machines were bought. Some of the cash has been used to help with the medical costs of the elderly sisters. We thank Laurence Saad of Ezulwini Lodges as well as Father Emil of Radio Veritas and Gunther Simmermacher of the Southern Cross Newspaper for all they did. The prize was won by Father Herman van Dijck. May 2015 be a successful and rewarding year for you and yours.